Seventeen species of bat are found in the United Kingdom and all of these are strictly protected by law in response to a dramatic decrease in their numbers – six kinds are officially classed as “endangered” and a further six have been designated “vulnerable”. Listed as “European protected species” a number of pieces of legislation – principally the Wildlife and Countryside Act 1981 – protect bats and their roosts throughout the UK, making it illegal to kill, injure or disturb a bat and this includes blocking up any entrance holes they may be using. Unfortunately, with the likes of Count Dracula as a front-man, it is not entirely surprising that bats get a bit of a bad press and a large number of misconceptions abound! They are not flying mice, even though they do look a bit similar, they are certainly not blind, nor are they about to go out of their way to get caught up in your hair and there are no vampire bats in Britain – at least not outside of zoos. Bats are surprisingly frequent visitors to old and new houses alike, though since they are not noisy or smelly,(although they do make sounds they cannot normally be heard by human ears) nor do they cause damage, householders are often completely unaware of their presence. British bats eat insects and other invertebrates, so in the winter when their food source is in short supply, they hibernate. Although they see out the winter in a range of places including trees and underground caves, houses and other buildings are commonly used as summer maternity quarters and this is when they are most likely to be encountered. Bats are mammals – like us – and give birth to live young in June, which they feed on milk. 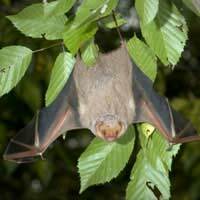 When the female bats fly off in search of food, the babies are left behind. The young are tiny and can easily fall through very small gaps between floor boards or beside pipes – often dropping into unexpected places such as the kitchen sink or bath and this is frequently the first the householder knows about the nursery in the roof. Adult bats may also sometimes be found in the house, particularly if you have been rearranging things in your loft or attic, inadvertently blocking their exit route in the process – leaving them hunting for an alternative way out. Moving anything which might be closing off a hole – especially things stacked against outside walls – should stop them visiting your rooms. It is important to be aware, however, that it is illegal to deliberately block their holes – even if they are not present at the time – so waiting until dusk and then cementing up their exit is simply not on. Since bats are heavily protected, any work likely to affect them must be undertaken with care and the approval of the relevant Statutory Nature Conservation Organisation. Dependent on where in the UK you live, this will be Natural England, the Countryside Council for Wales, Scottish Natural Heritage or the Environment and Heritage Service, Northern Ireland. Each case is viewed on its individual merits and it is sometimes possible to obtain a licence from these bodies to carry out work which would otherwise be illegal. However, the process is not a simple one and not to be undertaken lightly. As a general rule, any work which will result in the destruction of a breeding or resting place or disturb the bats themselves, will need a licence. This would include, for example, knocking down or converting buildings known to be used by bats or making significant alterations to roof spaces where bats have been found. Some activities, however, can avoid the need for a licence if they are properly planned, such as re-roofing, if it is done when the bats are not in residence and the entrance points are not affected, or timber treatment – again when the animals themselves are not present – provided approved chemicals are used. The special legal status of these animals makes it essential that the proper authorities are consulted as soon as possible if any kind of work is planned, to avoid any possible difficulties at a later date. While bats themselves are harmless, the legislation to protect them has real teeth. It carries a maximum fine of £5,000 per offence – and £5,000 per bat, if more than one is involved – together with the additional possibility of six months imprisonment and the forfeiture of any items used – including vehicles. While it may be a little alarming to find that you are unexpectedly sharing your house with the bat equivalent of a mothers and toddlers group, these much maligned animals certainly do not deserve the sinister reputation that all the horror films seem to have given them!